A protocol is presented to prepare polyvinyl alcohol-co-itaconic acid hydrogels with varying stiffness, which were grafted with and without oligopeptides, to investigate the effect of the stiffness of biomaterials on the differentiation and proliferation of stem cells. The stiffness of the hydrogels was controlled by the crosslinking time. Sung, T. C., Li, H. F., Higuchi, A., Ling, Q. D., Yang, J. S., Tseng, Y. C., Pan, C. H., Alarfaj, A. A., Munusamy, M. A., Kumar, S., Hsu, S. T., Murugan, K. Human Pluripotent Stem Cell Culture on Polyvinyl Alcohol-Co-Itaconic Acid Hydrogels with Varying Stiffness Under Xeno-Free Conditions. J. Vis. Exp. (132), e57314, doi:10.3791/57314 (2018). The effect of physical cues, such as the stiffness of biomaterials on the proliferation and differentiation of stem cells, has been investigated by several researchers. However, most of these investigators have used polyacrylamide hydrogels for stem cell culture in their studies. Therefore, their results are controversial because those results might originate from the specific characteristics of the polyacrylamide and not from the physical cue (stiffness) of the biomaterials. Here, we describe a protocol for preparing hydrogels, which are not based on polyacrylamide, where various stem, cells including human embryonic stem (ES) cells and human induced pluripotent stem (iPS) cells, can be cultured. Hydrogels with varying stiffness were prepared from bioinert polyvinyl alcohol-co-itaconic acid (P-IA), with stiffness controlled by crosslinking degree by changing crosslinking time. The P-IA hydrogels grafted with and without oligopeptides derived from extracellular matrix were investigated as a future platform for stem cell culture and differentiation. The culture and passage of amniotic fluid stem cells, adipose-derived stem cells, human ES cells, and human iPS cells is described in detail here. The oligopeptide P-IA hydrogels showed superior performances, which were induced by their stiffness properties. 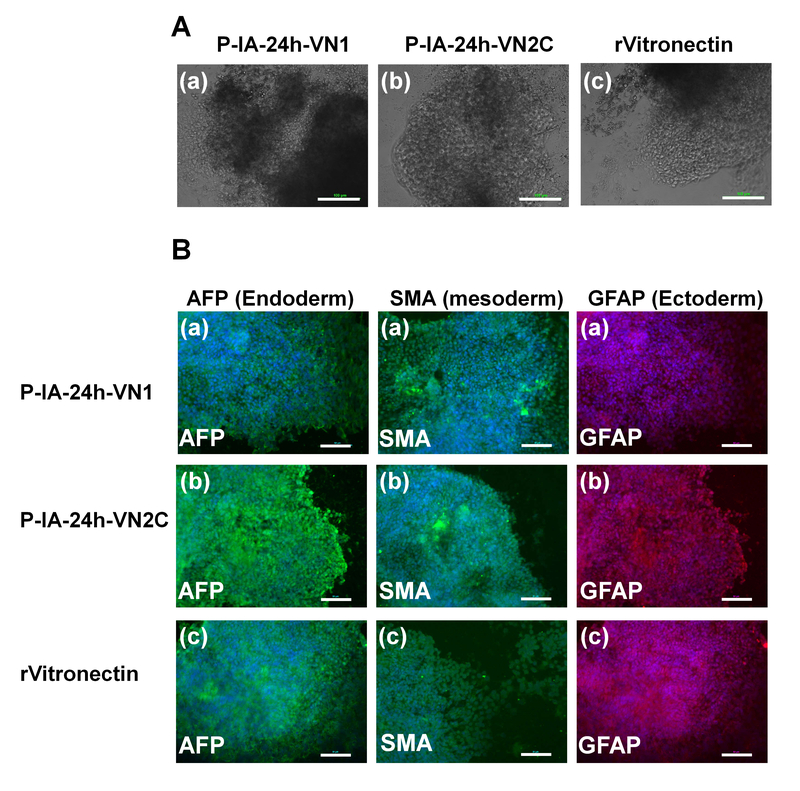 This protocol reports the synthesis of the biomaterial, their surface manipulation, along with controlling the stiffness properties and finally, their impact on stem cell fate using xeno-free culture conditions. Based on recent studies, such modified substrates can act as future platforms to support and direct the fate of various stem cells line to different linkages; and further, regenerate and restore the functions of the lost organ or tissue. The fate of stem cell differentiation into a specific lineage of cells and the long-term proliferation of stem cells, especially human induced pluripotent (iPS) cells and human embryonic stem (ES) cells, is known to be regulated by inhibitors, growth factors, and/or small bioactive molecules in culture media. Recently, the physical cues of the biomaterials, particularly the stiffness of cell culture biomaterials, have been recognized to be an important factor guiding the fate of stem cell proliferation and differentiation1,2,3,4,5,6. Therefore, several researchers have started to investigate the fate of stem cells, which are cultured on hydrogels, on differentiation, mainly using polyacrylamide hydrogels with varying stiffness. The stiffness of biomaterials can control focal adhesions, cell morphology, cell phenotype, and stem cell adhesion, especially in two-dimensional (2-D) cultivation1,2,3,5. Mechano-sensing of biomaterials by stem cells is generally controlled by focal adhesion signaling via integrin receptors. NMMIIA, nonmuscle myosin IIA-dependent contractility of the cytoskeleton of actin plays a critical role in the mechanosensing process of stem cells in 2-D cell cultivation systems3,4,5,7,8,9,10,11. Engler and his colleagues developed an interesting notion that adult stem cells, such as bone marrow stem (BMS) cells cultivated on cell culture biomaterials with a similar stiffness to that of specific tissues, tend to differentiate into cells originated from specific tissues5. BMS cells incubated on 2-D soft polyacrylamide hydrogels coated with collagen type I (with a stiffness comparable to that of brain tissues) in expansion media were spontaneously induced to differentiate into early neuron lineages, whereas BMS cells cultured on hydrogels with a stiffness similar to that of muscle or collagenous bone tissues were found to induce differentiation into early lineages of myocytes and osteoblasts, respectively, on 2-D polyacrylamide hydrogels3,5. Many researchers have investigated the stem cell fate of differentiation cultured on polyacrylamide hydrogels immobilized with collagen type I12,13,14,15,16,17,18,19,20,21. However, it should be mentioned that some contradictory reports1,18,22,23,24 exist for the well-known idea suggested by Engler et al.5 This is because Engler's idea5 was developed solely on polyacrylamide hydrogels and their results have originated from specific characteristics of the biomaterial (polyacrylamide), and not solely from the physical cue (stiffness) of the biomaterial. Therefore, it is important to develop another type of hydrogel, of which the stiffness can be controlled by crosslinking of the hydrogels. For this purpose, bioinert hydrogels were developed, which were prepared from polyvinyl alcohol-co-itaconic acid (P-IA) with a different stiffness, which was controlled by the crosslinking degree with a changing crosslinking time25,26,27,28,29,30,31,32. The stem cells can be cultivated on nonmodified P-IA hydrogels, as well as P-IA hydrogels grafted with extracellular matrices (ECMs) and oligopeptides. In a previous study25, human hematopoietic stem cells (hHSCs) from umbilical cord blood were cultivated on P-IA hydrogels with different stiffness values ranging from a 3 kPa to 30 kPa storage modulus where fibronectin or an oligopeptide derived from fibronectin (CS1, EILDVPST) was grafted onto the P-IA hydrogels. High ex vivo fold expansion of hHSCs was observed in the P-IA hydrogels grafted with CS1 or fibronectin, which displayed an intermediate stiffness ranging from 12 kPa to 30 kPa25. Human iPS and ES cells cannot be cultivated on conventional tissue culture polystyrene (TCP) dishes33,34 because human ES and iPS cells require specific binding to ECMs, such as vitronectin or laminin to maintain their pluripotency during long-term culture. Therefore, several structures of oligopeptide-grafted P-IA hydrogels with optimal stiffness characteristics were designed and prepared in formations of a single chain, a single chain with a joint segment, a dual chain with a joint segment, and a branched-type chain32. Oligopeptide sequences were selected from integrin- and glycosaminoglycan-binding domains of ECMs. The P-IA hydrogels grafted with vitronectin-derived oligopeptides with a dual chain or joint segment, which have a storage modulus at approximately 25 kPa, supported the long-term culture of human ES and iPS cells for over 12 passages under xeno-free and chemical defined conditions32. The joint segment and dual chain with cell adhesion molecules on the hydrogels facilitated the proliferation and pluripotency of human ES and iPS cells32. Here, a protocol for preparing P-IA hydrogels (with a storage modulus from 10 kPa to 30 kPa, which was measured under wet conditions in the air) grafted with and without oligopeptides or ECMs is described. How to culture and passage several stem cells (including amniotic fluid stem cells, adipose-derived stem cells, human ES cells, and human iPS cells) is shown. The experiments in this study were approved by the ethics committees of the Taiwan Landseed Hospital (IRB-13-05) and the National Central University. All experiments were conducted in accordance with all relevant and applicable governmental and institutional guidelines and regulations during this study. Purify P-IA with carboxylic acid group with a degree of hydrolysis of >96.5% by washing P-IA with ethanol. Place 20 g of P-IA into 200 mL of ethanol in a 500-mL conical beaker and agitate on a magnetic stirrer for 24-30 h. Exchange the ethanol with fresh ethanol every 8-10 h.
Remove P-IA from the ethanol by filtration using a Büchner funnel. Dry P-IA by vacuum drying at room temperature for 24 h.
NOTE: It is recommended to clean the trap in the vacuum drying system (by the removal of ethanol) frequently, especially during the initial few hours, because the trap tends to become clogged after the removal of a large amount of ethanol from P-IA. NOTE: Add the polymer very slowly into the solvent (water). It is recommended to take at least 15 min to add the P-IA into the solvent. If solvent is added into the polymer, the polymer would not be dissolved completely. Be careful not to generate explosive boiling of the P-IA solution. Use protective glasses during preparation of the P-IA solution. The heating process of the P-IA solution is essential to dissolve crystalline P-IA. It is suggested (and preferable) to prepare the P-IA solution in a relatively clean experimental room, if possible. Dissolve the P-IA in pure water to a 0.050 weight% concentration for the cell cultivation experiment or a 0.50 weight% concentration for the rheometer measurement: for example, dissolve 50 mg of P-IA in 100 mL of pure water for cell culture and 500 mg of P-IA in 100 mL of deionized (DI) water for the rheometer measurements. Agitate the P-IA solution for 1 h on the hot plate. NOTE: To avoid explosive boiling, do not heat the solution over 95 °C. Explosive boiling of the polymer solution at a high temperature may generate skin burns. Therefore, perform the heating of P-IA very carefully, and monitor the temperature of the P-IA solution during the heating. After the P-IA solution was cooled at ambient temperature, agitate the P-IA solution at room temperature for 48 h. Leave hot P-IA solution on the hot plate without heating, and then leave it without agitation at room temperature for 20-24 h to ensure that air bubbles are not present in the P-IA solution. Make the composition of the crosslinking solution 1.0 weight% glutaraldehyde from 25% aqueous glutaraldehyde solution, 20.0 weight% Na2SO4 using 99% > purity, and 1.0 weight% H2SO4. For example, for one 6 or 12 well cell culture plate, add 100 µL of glutaraldehyde solution, 2 g of sodium sulfate, and 100 µL of sulfuric acid into 10 mL of pure water. NOTE: Use DMEM/F12 media, essential 6 media, and essential 8 media for the cell culture. Return frozen 50X Essential 8 supplement slowly to the solution overnight by thawing in a 4 °C refrigerator. Add one bottle of 50X Essential 8 supplement into one bottle of Essential 8 basal media. Separate the media into small aliquots (50 mL each) in 100 mL centrifugation tubes, then store the media at -20 °C. Inject a 1 mL aliquot of the P-IA solution into a 35 mm TCP dish, and dry the dish in a 45 °C oven for 2 days to produce a P-IA film in a clean bench. Immerse the P-IA films into an aqueous crosslinking solution for 0.5, 1, 2, 4, 6, 12, 24, and 48 h.
NOTE: 'P-IA-X' (e.g., P-IA-12 h) refers to a P-IA hydrogel crosslinked for X h (e.g., 12 h). After crosslinking, rinse the P-IA hydrogels with pure water at ambient temperature, and then keep hydrogels in pure water at ambient temperature in a clean bench. Sterilize the P-IA hydrogels by immersion in a 75.0 volume/volume% ethanol solution for 1 min, rinse the P-IA hydrogels in pure water six times, and then keep the P-IA hydrogels in pure water until used for cell cultivation. Activate the P-IA hydrogels via immersion in 1 mL of an aqueous solution containing 10 mg/mL N-(3-Dimethylaminopropyl)-N'-ethylcarbodiimide hydrochloride (EDC) and 10 mg/mL N-hydroxysuccinimide (NHS) for 1 h at 37 °C or 4 h at 4 °C. Rinse the P-IA hydrogels with 1 mL of phosphate buffered saline (PBS, pH 7.2) 3 times and immerse the P-IA hydrogels in a PBS solution containing 1 mL of oligopeptide (100-1,500 µg/mL) or ECM (10-100 µg/mL) for 24 h at 4 °C. NOTE: The oligopeptide sequences and ECMs used for stem cell culture are summarized in Table 1. After grafting the oligopeptide or ECM, wash the P-IA hydrogels with pure water 3 times. NOTE: The P-IA hydrogels grafted with Y µg/mL of oligopeptide or ECM (Z) are hereafter referred to as P-IA-Xh-Z orP-IA-Xh-Z-Y, where X refers to the crosslinking time (h), Y indicates the concentration of the oligopeptide or ECM, and Z indicates a different oligopeptide or ECM. Maintain human ES (e.g., WA09 or H9) cells or human iPS (e.g., HS0077) cells on Matrigel in Essential 8 media in 6 cm dishes using standard human ES/iPS cell culture protocols28,32. Incubate near-confluent human ES/iPS cells with 2.0 mg/mL dispase II in DMEM/F-12 media at 37 °C for 8-10 min and then rinse human ES/iPS cells twice with DMEM/F12 media. After the addition of 2 mL of DMEM/F-12 media to human ES/iPS cell culture dishes, detach weakly adherent colonies using a cell scraper or by pipetting. Collect the human ES/iPS cells into 15 mL centrifugation tubes and centrifuge human ES/iPS cells at 160 × g for 5 min at 37 °C. After centrifugation, discard the DMEM/F12 and suspend the human ES/iPS cells in 1 mL of E8 media, and then count the cell density by using a cell counter. Inoculate the ES/iPS cells after the appropriate density adjustment (1-5 x 104 cells per cm2 for passaging or as indicated) into new culture dishes (P-IA hydrogels grafted with the oligopeptide or ECM). Measure the alkaline phosphatase (AP) activity of human ES/iPS cells using a standard alkaline phosphatase live staining. Perform immunostaining of Tra-1-81, SSEA-4, Sox2, and Oct3/4 on hES and hiPS cells to investigate pluripotency following the conventional protocol28,32. Add a 0.5 mL volume of 4% (volume/volume) paraformaldehyde into each 24 well dish in which the human ES/iPS cells were cultured, and subsequently, incubate the dishes for 15 min at 4 °C to fix the cells. Aspirate the paraformaldehyde solution from each well. Then, add 1 mL of PBS per well and aspirate PBS to rinse the cells. Perform the rinsing process 3 times. Permeabilize cell membranes by adding 0.5 mL of 0.3% (volume/volume) Triton-X 100 solution in PBS for 30 min at room temperature. Aspirate the Triton-X 100 solution and add 300 µL of 2% (weight/volume) bovine serum albumin (BSA) in PBS (blocking buffer) into each well, and incubate for 30 min at room temperature. Remove the blocking buffer by pipetting, and subsequently, add the desired primary antibodies (Oct3/4 (1:200), Sox2 (1:200), SSEA-4 (1:200), and Tra-1-81(1:200) by pipette, see Table 2) into each well, where 1:200 indicates the antibodies were diluted with PBS 200-fold and incubated for one day at 4 °C. Aspirate the primary antibody solution, and wash the cells with 300 µL of 0.05% Tween 20 in PBS solution 3 times at room temperature. Add 300 µL of secondary antibodies (1:200, see Table 2), which are specific to the primary IgG subtype, in 2% (weight/volume) BSA solution into each well and incubate for 1 h at room temperature in the dark. Wash the cells with 300 µL of 0.05% Tween 20 in PBS solution 3 times at room temperature in the dark. Analyze the stained cells by fluorescence microscopy or confocal microscopy. Investigate pluripotency of human ES/iPS cells by embryoid body (EB) formation at passages 10 and 20. NOTE: Near 80% confluence in 6-well plates is sufficient for the preparation of EB formation. Rinse human ES or iPS cells with 2 mL of DMEM/F-12 media twice, and then immerse the cells in 1.5 mL of Essential 6 media. Cut near 80% confluent human ES or iPS cells into approximately 32 pieces using 200 µL tips. Next, detach the cells from the dishes by using a cell scraper. Collect human ES/iPS cells and transfer into a 6-well ultralow attachment dish. Exchange Essential 6 media by pipetting old media and adding fresh media every 2 days. NOTE: Culture the cells in suspension for 2 weeks at 37 °C with 5% CO2. After the EBs were homogenously suspended in Essential 6 media, transfer EBs to culture on 24-well TCP dishes coated with 0.1 weight% gelatin, and culture the cells in Essential 6 media for an additional week. Stain the cells with antibodies against markers of the cells derived from three embryonic germline layers [AFP (endoderm), GFA (ectoderm), β III-Tubulin (ectoderm), and SMA (mesoderm)] and evaluate the cells by the immunostaining method described above. Investigate pluripotency of human ES/iPS cells by teratoma formation at passages 10 and 20. NOTE: 5 dishes of near 80% confluence in 6-well plates are sufficient for teratoma formation (at least 3 x 106 cells are necessary for the teratoma formation experiments). Rinse the cells with 2 mL DMEM/F-12 media twice, and then add 1.5 mL DMEM/F-12 media to the cell culture dishes. Cut nearly 80% confluent human ES or iPS cells into approximately 32 pieces by using 200 µL tips. Next, detach the cells from the dishes by using a cell scraper. Collect human ES/iPS cells into a 15-mL centrifugation tube and centrifuge the cells at 160 × g for 5 min at 37 °C. After centrifugation, suspend the cell pellets in 100 µL DMEM/F12, and then mix the cell pellets with 100 µL Matrigel (1:1 volume ratio). Transfer the cell suspension into a -20 °C pre-cooled syringe. Inject, in total, at least 3 × 106 cells subcutaneously into male NOD-SCID (NOD.CB17-Prkdascid/JNarl) mice (5-8 weeks). After 5-8 weeks, dissect teratomas, fix with 4.0% (weight/volume) paraformaldehyde solution, and then store at 4 °C. Fix the teratoma with paraffin, slice the paraffin-embedded teratomas, and stain with hematoxylin and eosin (H&E) using a standard protocol28,32. NOTE: Researchers may send fixed teratoma tissue to the company to fix the teratomas with paraffin, slice the paraffin-embedded teratomas, and stain the sample with H&E, which is typically used in Department of Pathology in hospitals. Warm culture media (DMEM containing 1% antimycotic antibiotic and 10% fetal bovine serum (FBS)), 0.25% of trypsin-EDTA, and PBS to 37 °C in a water bath prior to use. Wash human ADS cells by pipetting 10 mL of PBS into each 6-cm culture dish where the cells are cultured. Add 1 mL of trypsin-EDTA solution (0.25%) into the 6-cm culture dishes and incubate the solution at 37 °C for 5 min. Observe the cells in the 6 cm culture dishes under microscopy to confirm that the cells are detached. Collect the cells into a 15-mL centrifuge tube, and add an equal volume of culture media (DMEM containing 1% antimycotic antibiotic and 10% FBS) into the centrifuge tube to neutralize the trypsin-EDTA. Centrifuge the cells at 250 × g for 5 min at 37 °C. After centrifugation, discard the supernatant carefully by pipetting, without disturbing the cell pellet. Resuspend the cells in the culture media, and then seed the cells at the appropriate density (5-10 x 103 cells per cm2 for passaging or as indicated) into new culture dishes (P-IA hydrogels grafted with and without oligopeptides and ECM). Warm cultivation media (DMEM/MCDB 201 (2:3) containing 20% fetal bovine serum (FBS), 5 ng/mL bFGF and 1% antimycotic antibiotic), 0.25% of trypsin-EDTA, and PBS to 37 °C in a water bath prior to use. Wash human AFS cells by pipetting 10 mL of PBS in each 6-cm culture dish where the cells are cultured. Add 1 mL of trypsin-EDTA solution (0.25%) into 6-cm culture dishes, and incubate the cells at 37 °C for 5 min. Observe the cells on 6-cm culture dishes under microscopy to confirm the cells are detached. Collect the cells into a 15-mL centrifuge tube, and add an equal volume of culture media (DMEM/MCDB 201 (2:3) containing 20% fetal bovine serum (FBS), 5 ng/mL bFGF and 1% antimycotic antibiotic) into the centrifuge tube to neutralize the trypsin-EDTA. After centrifugation, discard the supernatant carefully without disturbing the cell pellet by pipetting. Resuspend the cells in the cultivation media and then seed the cells at the appropriate density (5-10x103 cells per cm2 for passaging or as indicated) into new culture dishes (P-IA hydrogels grafted with and without oligopeptide and ECM). P-IA hydrogels grafted with ECM-derived oligopeptide (oligoECM) or ECM with different elasticities were prepared by following the reaction scheme, as seen in Figure 1A, using different types of oligoECM (Figure 1B). The elasticities of the hydrogels were regulated by the applied crosslinking intensity (time) (Figure 1C). P-IA hydrogels grafted with vitronectin-derived oligopeptides, which has a storage modulus of 25.3 kPa (24 h crosslinking time), supported the long-term culture of human iPS and ES cells for over 10-20 passages. Particularly, P-IA hydrogels grafted with a joint segment (P-IA-24h-VN1G) or a dual chain (P-IA-24h-VN2G) supported the pluripotency of human iPS and ES cells, which were prepared with a relatively lower concentration of oligoECM (200-500 μg/mL) than P-IA-VN1 hydrogels, which necessitated using a high concentration of oligoECM (>1000 μg/mL) to maintain the pluripotency of human iPS and ES cells28,32. 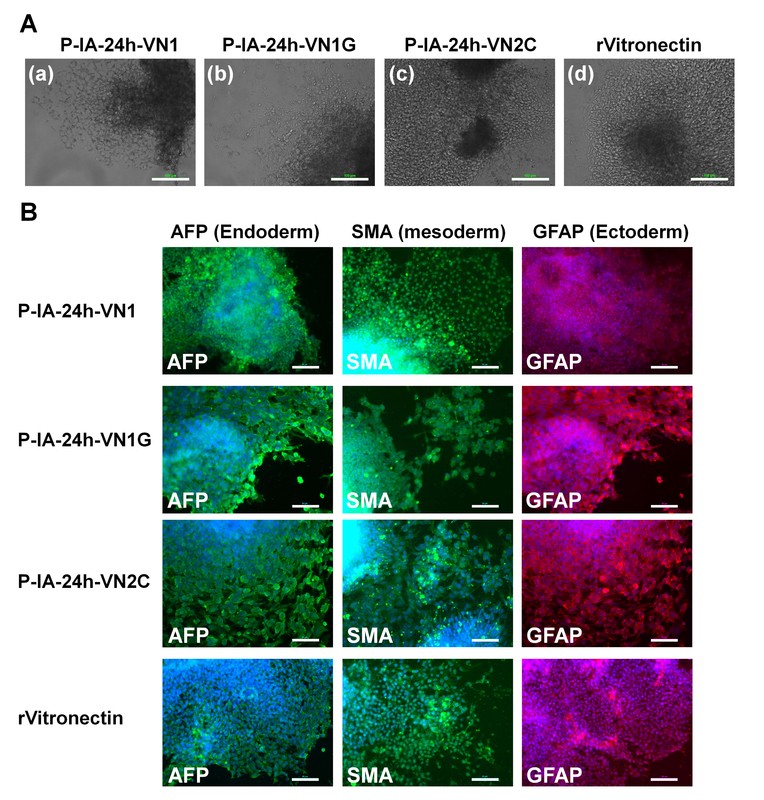 Human ES cells maintained on mouse embryonic fibroblasts (MEFs) were shifted to culture on other synthesized coating materials (e.g., Synthemax II) coated dishes and P-IA-24h-VN1 hydrogel dishes (Figure 2)28. 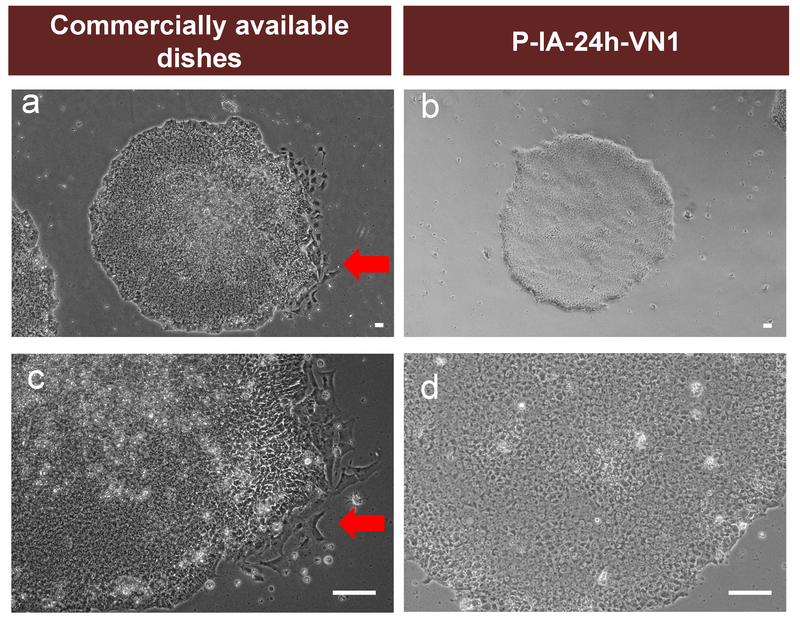 Human ES cells cultured on commercially available coating dishes were found to more easily differentiate, especially at the edge of the colonies (Figure 2a and 2c), whereas human ES cells could maintain their pluripotency on P-IA-24h-VN1-1000 hydrogel dishes because the differentiated cells could not be observed from the morphology of human ES cells on P-IA-24h-VN1-1000 hydrogel dishes (Figure 2b and 2d)28. The pluripotency of human ES (Figure 3A) and iPS (Figure 3B) cells cultured on P-IA-24h hydrogels grafted with oligoECM (P-IA-24h-VN1-1000, P-IA-24h-VN1G-1000, P-IA-24h-VN2C), as well as conventional recombinant vitronectin (rVitronectin)-coated dishes, was evaluated based on the expression of pluripotent maker proteins (Nanog, Sox2, and Oct3/4) after the cells were cultured on each dish in xeno-free conditions using Essential 8 media for 10 passages32. These pluripotency proteins were satisfactorily expressed on human iPS and ES cells cultured on P-IA hydrogels grafted with oligoECM, as well as on rVitronectin-coated dishes in xeno-free conditions. Evaluation of the differentiation ability into the cells derived from three germ layers in vitro (EB formation) and in vivo (teratoma formation) is essential to verify the pluripotency of human ES and iPS cells after cultivation on synthetic biomaterials. Therefore, human ES cells (Figure 4) and human iPS cells (Figure 5) were cultivated on P-IA-oligoECM hydrogel dishes and recombinant vitronectin-coated dishes for 10 passages, and subsequently, the cells were cultured in suspension to form EBs. The EBs were further cultivated on gelatin-coated dishes for a few weeks to observe the ability of the cells to spread on the dishes (Figure 4A and Figure 5A)32. Differentiated human ES (Figure 4B) and iPS (Figure 5B) cells were immunostained for proteins derived from three germ layers: alpha-fetoprotein (AFP, endoderm), smooth muscle actin (SMA, mesoderm), and glial fibrillary acidic protein (GFAP, ectoderm)32. Both human iPS and ES cells were found to differentiate into the cells derived from all three germ layers, indicating another verification of the pluripotency of human iPS and ES cells, even after cultivation on P-IA hydrogels grafted with oligoECM in xeno-free conditions for the long term (passage >10 passages). The differentiation ability of human ES cells into the cells originated from three germ layers in vivo (teratoma formation assay) was also evaluated. Human ES cells, which were cultivated on P-IA-VN1-1000 (Figure 6A) and P-IA-VN2C-1000 (Figure 6B) in xeno-free culture conditions for 10 passages, were injected subcutaneously into NOD-SCID mice32. The teratomas were isolated from the mice, and teratoma tissue sections were fixed and stained with H & E (Figure 6A and 6B)32. The teratomas displayed the existence of cells originating from all three germ layers: endoderm (intestinal epithelium, Figure 6A(b) and 6B(b)), mesoderm (cartilage, Figure 6A(c) and 6B(c)), and ectoderm (neuroepithelium, Figure 6A(d); retinal pigment epithelium, Figure 6B(d)). These results suggest that human ES cells cultured on P-IA-24h-VN1-1000 and P-IA-24h-VN2C-1000 in xeno-free conditions for 10 passages can differentiate into cells originating from three germ layers, indicating that their pluripotency is maintained in vivo. Human AFS cells were also cultured in unmodified P-IA hydrogel, P-IA-oligoECM hydrogel, and TCP dishes in expansion media. Figure 7 shows the morphologies of human AFS cells cultivated after four days of culture in P-IA and P-IA-oligoECM hydrogel dishes with elasticities (E') of 12.2 (crosslinking time = 6 h), 18.3 (crosslinking time = 12 h), 25.3 (crosslinking time = 24 h), and 30.4 kPa (crosslinking time = 48 h) using an oligoECM concentration of 0 or 50 μg/mL as well as TCP dishes with 3-12 GPa of stiffness30. Human AFS cells could not proliferate on P-IA hydrogel dishes with or without oligoECM when the stiffness of the P-IA hydrogels was less than 11 kPa (PV-2h, PV-2h-Y, PV-4h, and PV-4h-Y), whereas human AFS cells could proliferate with or without oligoECM when E' was greater than 12 kPa, with the exception of the P-IA-6h and PV-IA-6h-COL1 hydrogel dishes. P-IA-6h and P-IA-6h-COL1 seem not to be favorable for the culture of human AFS cells because the soft cell culture biomaterials halt the cell cycle progression30. The above results suggest that P-IA hydrogel dishes are an optimal material for long term stem cell cultivation and maintain the pluripotency of the stem cells by selection of specific stiffness and oligoECM, as well as the optimal reaction concentration of oligoECM (surface density of oligoECM). Figure 1: Preparation of P-IA hydrogels grafted with oligoECM or ECM. (A) Scheme of the reaction for P-IA hydrogels grafted with ECM and ECM-derived oligopeptide (oligoECM)29. Copyright 2015. Adapted with permission from The Royal Society of Chemistry. 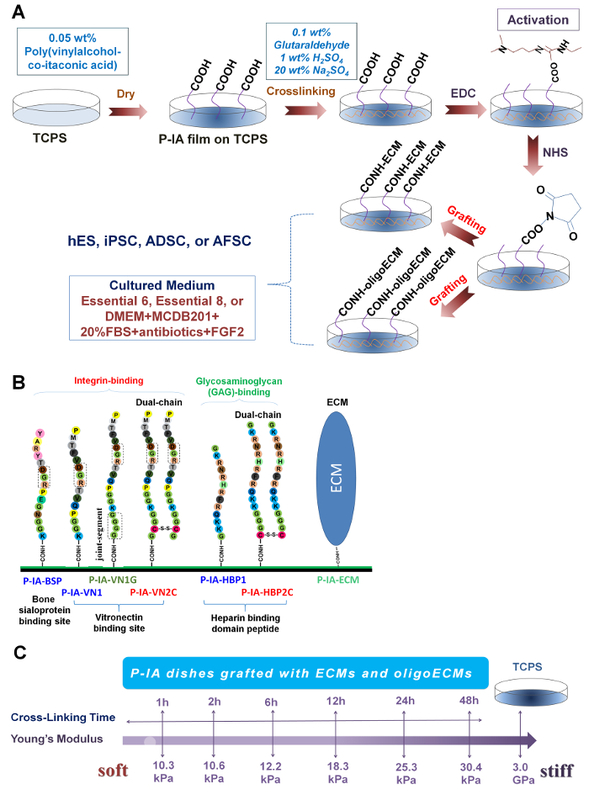 (B) Design and sequence of oligopeptides grafted on P-IA hydrogels. Single chain oligopeptides (P-IA-BSP, P-IA-VN1, and P-IA-HBP1), single chain oligopeptides with a joint segment (P-IA-VN1G), and dual chains (P-IA-VN2C and P-IA-HBP2C) and ECM (P-IA-ECM) were grafted on P-IA hydrogels32. Adapted under a Creative Commons Attribution License. (C) Stiffness of P-IA hydrogels prepared by different periods of crosslinking29. Copyright 2015. Adapted with permission from The Royal Society of Chemistry. Please click here to view a larger version of this figure. Figure 2: Comparison of human ES cell cultures on P-IA-24h-VN1 hydrogels and commercially available coating dishes. Morphology of human ES cells (WA09) cultivated on commercially available coating dishes (a, b) and P-IA-24h-VN1-1000 (c, d) dishes at passage 1 when human ES cells were shifted from cultivation on mouse embryonic fibroblasts (MEFs) into cultivation on commercially available coating dishes or PVA-24h-VN1-1000 dishes. Red arrows show the differentiated human ES cells. The scale bars indicate 50 µm (a, b) and 100 µm (c, d)28. Adapted under a Creative Commons Attribution License. Please click here to view a larger version of this figure. Figure 3: Characterization of the pluripotency of human ES and iPS cells on P-IA hydrogels grafted with different oligopeptide designs. (A) Expression of pluripotency proteins Nanog (red), Sox2 (green), and Oct3/4 (green) on human ES (H9) cells analyzed by immunostaining with dual staining with Hoechest33342 for nuclear labeling (blue) after culturing on (a) P-IA-24h-VN1-1000, (b) P-IA-24h-VN1G-1000, and (c) P-IA-24h-VN2C-1000 hydrogels, and on (d) recombinant vitronectin (rVitronectin)-coated dishes under xeno-free conditions for 10 passages. (B) Expression of pluripotency proteins Nanog (red), Sox2 (green), and Oct3/4 (green) on human iPS cells analyzed by immunostaining with dual staining with Hoechest33342 for nuclear labeling (blue) after culturing on (a) P-IA-24h-VN1-1000 hydrogel, (b) P-IA-24h-VN2C-1000 hydrogel, and (c) recombinant vitronectin (rVitronectin)-hydrogels coated dishes under xeno-free conditions for 10 passages32. The scale bars indicate 50 µm. Adapted under a Creative Commons Attribution License. Please click here to view a larger version of this figure. Figure 4: Characterization of the differentiation ability of human ES cells on P-IA hydrogels grafted with different oligopeptide designs. (A) Morphology of cells from EBs differentiated from human ES (H9) cells after culturing on (a) P-IA-24h-VN1-1000, (b) P-IA-24h-VN1G-1000, and (c) P-IA-24h-VN2C-1000 hydrogels, and (d) recombinant vitronectin (rVitronectin)-coated dishes under xeno-free conditions for 10 passages. The scale bars indicate 100 µm. (B) Expression of an ectoderm protein (GFAP, red), mesoderm protein (SMA, green), and endoderm protein (AFP, green) in human ES (H9) cells evaluated by immunostaining with dual staining with Hoechest33342 for nuclear labeling (blue) after culturing on P-IA-24h-VN1-1000, P-IA-24h-VN1G-1000, and P-IA-24h-VN2C-1000 hydrogels, and on recombinant vitronectin (rVitronectin)-coated dishes under xeno-free conditions for 10 passages32. The scale bars indicate 50 µm. Adapted under a Creative Commons Attribution License. Please click here to view a larger version of this figure. Figure 5: Characterization of the differentiation ability of human iPS cells on P-IA hydrogels grafted with different oligopeptide designs. 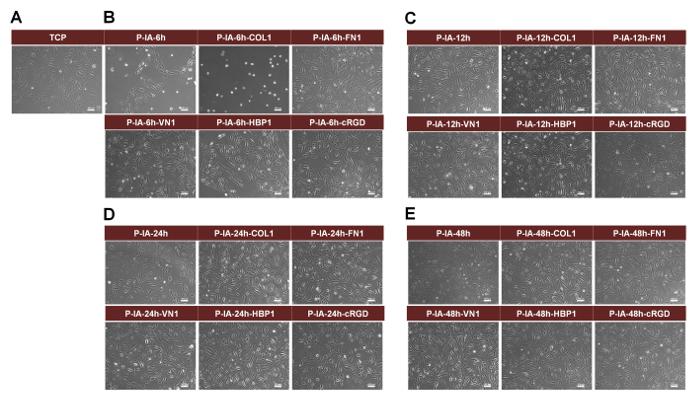 (A) Morphology of cells from EBs differentiated from human iPS (HPS0077) cells after culturing on (a) P-IA-24h-VN1-1000 hydrogels, (b) P-IA-24h-VN2C-1000 hydrogels, and (c) recombinant vitronectin (rVitronectin)-coated dishes under xeno-free conditions for 10 passages. The scale bars indicate 100 µm. (B) Expression of an ectoderm protein (GFAP, red), mesoderm protein (SMA, green), and endoderm protein (AFP, green) in human iPS (HPS0077) cells analyzed by immunostaining with dual staining with Hoechest33342 for nuclear labeling (blue) after culturing on (a) P-IA-24h-VN1-1000 hydrogels, (b) P-IA-24h-VN2C-1000 hydrogels, and (c) recombinant vitronectin (rVitronectin)-coated dishes under xeno-free conditions for 10 passages32. The scale bars indicate 50 µm. Adapted under a Creative Commons Attribution License. Please click here to view a larger version of this figure. Figure 6: Characterization of the differentiation ability of human ES (H9) cells in vivo after culturing on P-IA-24h-VN1 and P-IA-24h-VN2C hydrogels. (A)(a) Picture of a teratoma by injection with human ES cells after culturing on P-IA-24h-VN1-1000 hydrogels under xeno-free cell culture conditions after 10 passages. Tissues including (b) intestinal epithelium (endoderm), (c) cartilage (mesoderm), and (d) neuroepithelium (ectoderm) can be observed. (B)(a) Picture of a teratoma by injection with human ES cells after culturing on P-IA-24h-VN2C-1000 hydrogels under xeno-free cell culture conditions after 10 passages. Tissues including (b) intestinal epithelium (endoderm), (c) cartilage (mesoderm), and (d) retinal pigment epithelium (ectoderm) can be observed32. The scale bars indicate 100 µm. Adapted under a Creative Commons Attribution License. Please click here to view a larger version of this figure. Figure 7: Morphology of human AFS cells cultivated on TCP dishes and P-IA hydrogel dishes immobilized with or without ECM-derived oligopeptides after 4 days of culture. (A) Morphology of human AFS cells on TCP dishes. (B) Morphology of human AFS cells on P-IA-6h and P-IA-6h-Z hydrogel dishes (P-IA-6h, P-IA-6h-COL1-50, P-IA-6h-FN1-50, P-IA-6h-VN1-50, P-IA-6h-HBP1-50, and P-IA-6h-cRGD-50). (C) Morphology of hAFCs on P-IA-12h and P-IA-12h-Z hydrogel dishes (P-IA-12h, P-IA-12h-COL1-50, P-IA-12h-FN1-50, P-IA-12h-VN1-50, P-IA-12h-HBP1-50, and P-IA-12h-cRGD-50). (D) Morphology of human AFS cells on P-IA-24h and P-IA-24h-Z hydrogel dishes (P-IA-24h, P-IA-24h-COL1-50, P-IA-24h-FN1-50, P-IA-24h-VN1-50, P-IA-24h-HBP1-50, and P-IA-24h-cRGD-50). (E) Morphology of human AFS cells on P-IA-48h and P-IA-48h-Z hydrogel dishes (P-IA-48h, P-IA-48h-COL1-50, P-IA-48h-FN1-50, P-IA-48h-VN1-50, P-IA-48h-HBP1-50, and P-IA-48h-cRGD-50). The scale bars indicate 100 μm30. Copyright 2017. Adapted with permission from The Royal Society of Chemistry. Please click here to view a larger version of this figure. Table 1: ECM-derived oligopeptide sequences and ECM used in this study. Table 2: Antibodies used for immunostaining in this study. P-IA-oligoECM and P-IA-ECM hydrogels with varying stiffness were developed for the long-term expansion of human ES and iPS cells maintaining their pluripotency for over ten passages in xeno-free conditions, as well as for the culture of human AFS cells, ADS cells, and hematopoietic stem cells25,28,32. P-IA hydrogels immobilized with oligoECM are an excellent candidate for cell cultivation materials to investigate the effect of cell culture materials on the fate of differentiation and proliferation of various types of stem cells as well as primary cells and cancer cells. P-IA solution should be transparent, when P-IA solution is cast on the dishes. The crosslinking time decides the crosslinking intensity of P-IA hydrogels. 24 h crosslinking of P-IA hydrogels produces optimal hydrogels for human ES/iPS cell culture. Any oligopeptides and ECMs can be grafted on P-IA hydrogels using this protocol, where the oligopeptides and ECMs have free amino groups25,28,29,30,31,32. The surface density of the oligopeptides or ECMs can be detected by X-ray photoelectron spectroscopy (XPS) measurements, although XPS cannot present an absolute value of the surface density, but the existence of the oligopeptides or ECMs can be safely analyzed. P-IA hydrogels with and without grafted oligopeptides or ECMs can be prepared, which have storage modulus from 3-30 kPa, depending on the crosslinking time. It is rather difficult to prepare P-IA hydrogels having less storage modulus than 3 kPa and higher storage modulus than 30 kPa25,28,29,30,31,32. This is the limitation of the present hydrogel preparation method of chemical crosslinking of P-IA hydrogels. However, the present protocol provides another option of the hydrogels having different elasticity, which can support the culture of primary cells, cancer cells, or stem cells including human ES and iPS cells, but are not made of polyacrylamide. Especially, human ES and iPS cells cannot proliferate on polyacrylamide hydrogels, but can proliferate on P-IA hydrogels as shown in Figure 2, Figure 3, Figure 4, Figure 5, and Figure 6. Indeed, P-IA-24h-VN1 hydrogels supported human ES cell culture better than commercially available coating dishes (Figure 2). Therefore, P-IA hydrogels are preferable for the culture of human ES and iPS cells. It would be interesting to investigate optimal elasticity of the hydrogels where human ES and iPS cells are differentiated into specific lineages of the cells such as cardiomyocytes35, retinal pigment epithelium36, β cells6, and TH+ cells6 for future development of regenerative medicine. This research was partially supported by the Ministry of Science and Technology, Taiwan under grant numbers 106-2119-M-008 -003, 105-2119-M-008-006, and 104-2221-E-008-107-MY3. This research was also supported by the Taiwan Landseed Hospital Project (NCU-LSH-105-A-001). A Grant-in-Aid for Scientific Research (number 15K06591) from the Ministry of Education, Culture, Sports, Science and Technology of Japan is also acknowledged. A. Higuchi would like to acknowledge for the International Scientific Partnership Program (ISPP-0062) Vice Rectorate for Graduate Studies and Research, King Saud University, Riyadh 11451, Kingdom of Saudi Arabia. Higuchi, A., Ling, Q. D., Chang, Y., Hsu, S. T., Umezawa, A. Physical cues of biomaterials guide stem cell differentiation fate. Chem. Rev. 113, 3297-3328 (2013). Higuchi, A., et al. Physical cues of cell culture materials lead the direction of differentiation lineages of pluripotent stem cells. J. Mater. Chem. B. 3, 8032-8058 (2015). Wen, J. H., et al. Interplay of matrix stiffness and protein tethering in stem cell differentiation. Nat Mater. 13, 979-987 (2014). Murphy, W. L., McDevitt, T. C., Engler, A. J. Materials as stem cell regulators. Nat. Mater. 13, 547-557 (2014). Engler, A. J., Sen, S., Sweeney, H. L., Discher, D. E. Matrix elasticity directs stem cell lineage specification. Cell. 126, 677-689 (2006). Higuchi, A., et al. Polymeric design of cell culture materials that guide the differentiation of human pluripotent stem cells. Prog. Polym. Sci. 65, 83-126 (2017). Chen, W. Q., et al. Nanotopography Influences Adhesion, Spreading, and Self-Renewal of Human Embryonic Stem Cells. ACS Nano. 6, 4094-4103 (2012). Chowdhury, F., et al. Material properties of the cell dictate stress-induced spreading and differentiation in embryonic stem cells. Nat. Mater. 9, 82-88 (2010). McBeath, R., Pirone, D. M., Nelson, C. M., Bhadriraju, K., Chen, C. S. Cell shape, cytoskeletal tension, and RhoA regulate stem cell lineage commitment. Dev. Cell. 6, 483-495 (2004). Li, D., et al. Integrated biochemical and mechanical signals regulate multifaceted human embryonic stem cell functions. J. Cell Biol. 191, 631-644 (2010). Yang, M. T., Fu, J. P., Wang, Y. K., Desai, R. A., Chen, C. S. Assaying stem cell mechanobiology on microfabricated elastomeric substrates with geometrically modulated rigidity. Nat. Protoc. 6, 187-213 (2011). Shih, Y. R. V., Tseng, K. F., Lai, H. Y., Lin, C. H., Lee, O. K. Matrix Stiffness Regulation of Integrin-Mediated Mechanotransduction During Osteogenic Differentiation of Human Mesenchymal Stem Cells. J. Bone Miner. Res. 26, (4), 730-738 (2011). Du, J., et al. Integrin activation and internalization on soft ECM as a mechanism of induction of stem cell differentiation by ECM elasticity. Proc. Natl. Acad. Sci. U S A. 108, 9466-9471 (2011). Xue, R., Li, J. Y., Yeh, Y., Yang, L., Chien, S. Effects of matrix elasticity and cell density on human mesenchymal stem cells differentiation. J. Orthop. Res. 31, (9), 1360-1365 (2013). Mao, A. S., Shin, J. W., Mooney, D. J. Effects of substrate stiffness and cell-cell contact on mesenchymal stem cell differentiation. Biomaterials. 98, 184-191 (2016). Witkowska-Zimny, M., et al. Effect of substrate stiffness on differentiation of umbilical cord stem cells. Acta Biochim. Pol. 59, (2), 261-264 (2012). Witkowska-Zimny, M., et al. Effect of substrate stiffness on the osteogenic differentiation of bone marrow stem cells and bone-derived cells. Cell Biol. Int. 37, (6), 608-616 (2013). Macri-Pellizzeri, L., et al. Substrate stiffness and composition specifically direct differentiation of induced pluripotent stem cells. Tissue Eng. Part A. 21, (9-10), 1633-1641 (2015). Cozzolino, A. M., et al. Modulating the Substrate Stiffness to Manipulate Differentiation of Resident Liver Stem Cells and to Improve the Differentiation State of Hepatocytes. Stem Cells Int. 5481493 (2016). Mattei, G., Ferretti, C., Tirella, A., Ahluwalia, A., Mattioli-Belmonte, M. Decoupling the role of stiffness from other hydroxyapatite signalling cues in periosteal derived stem cell differentiation. Sci. Rep. 5, 10778 (2015). Zouani, O. F., Kalisky, J., Ibarboure, E., Durrieu, M. C. Effect of BMP-2 from matrices of different stiffnesses for the modulation of stem cell fate. Biomaterials. 34, (9), 2157-2166 (2013). Ye, K., Cao, L., Li, S., Yu, L., Ding, J. Interplay of Matrix Stiffness and Cell-Cell Contact in Regulating Differentiation of Stem Cells. ACS Appl. Mater. Interfaces. 8, (34), 21903-21913 (2016). Hogrebe, N. J., Gooch, K. J. Direct influence of culture dimensionality on human mesenchymal stem cell differentiation at various matrix stiffnesses using a fibrous self-assembling peptide hydrogel. J. Biomed. Mater. Res. A. 104, (9), 2356-2368 (2016). Olivares-Navarrete, R., et al. Substrate Stiffness Controls Osteoblastic and Chondrocytic Differentiation of Mesenchymal Stem Cells without Exogenous Stimuli. PLoS One. 12, e0170312 (2017). Kumar, S. S., et al. The combined influence of substrate elasticity and surface-grafted molecules on the ex vivo expansion of hematopoietic stem and progenitor cells. Biomaterials. 34, 7632-7644 (2013). Higuchi, A., Iijima, T. DSC investigation of the states of water in poly(vinyl alcohol) membranes. Polymer. 26, 1207-1211 (1985). Higuchi, A., Iijima, T. DSC investigation of the states of water in poly(vinyl alcohol-co-itaconic acid) membranes. Polymer. 26, 1833-1837 (1985). Higuchi, A., et al. Long-term xeno-free culture of human pluripotent stem cells on hydrogels with optimal elasticity. Sci Rep. 5, 18136 (2015). Wang, P. Y., et al. 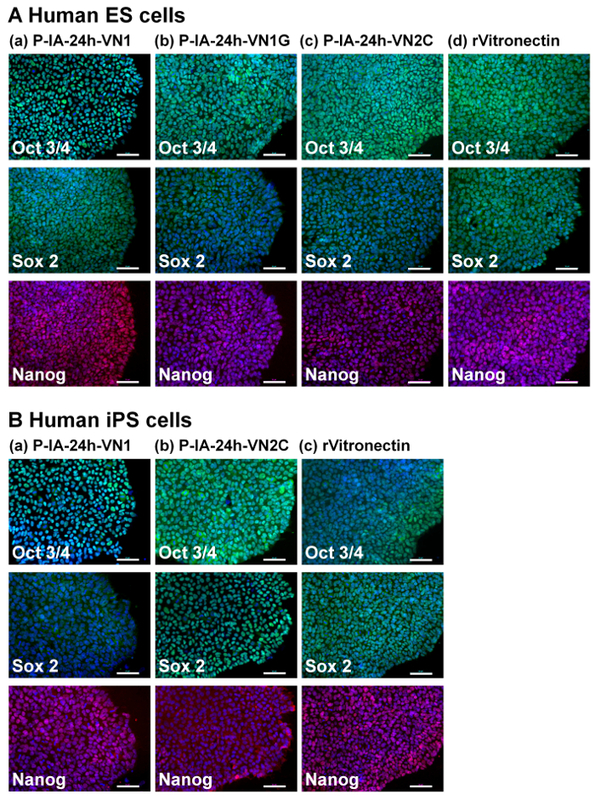 Pluripotency maintenance of amniotic fluid-derived stem cells cultured on biomaterials. J Mater Chem B. 3, 3858-3869 (2015). Muduli, S., et al. Proliferation and osteogenic differentiation of amniotic fluid-derived stem cells. J Mater Chem B. 5, 5345-5354 (2017). Muduli, S., et al. Stem cell culture on polyvinyl alcohol hydrogels having different elasticity and immobilized with ECM-derived oligopeptides. JPoly Eng. 37, 647 (2017). Chen, Y. M., et al. Xeno-free culture of human pluripotent stem cells on oligopeptide-grafted hydrogels with various molecular designs. Sci Rep. 7, 45146 (2017). Higuchi, A., Ling, Q. D., Ko, Y. A., Chang, Y., Umezawa, A. Biomaterials for the feeder-free culture of human embryonic stem cells and induced pluripotent stem cells. Chem Rev. 111, (5), 3021-3035 (2011). Higuchi, A., et al. Design of polymeric materials for culturing human pluripotent stem cells: Progress toward feeder-free and xeno-free culturing. Prog Polym Sci. 39, 1348-1374 (2014). Higuchi, A., et al. Stem cell therapies for myocardial infarction in clinical trials: bioengineering and biomaterial aspects. Lab Invest. 97, 1167-1179 (2017). Higuchi, A., et al. Stem cell therapies for reversing vision loss. Trends Biotechnol. 35, 1102-1117 (2017).